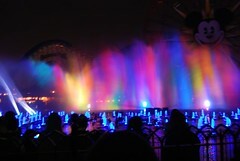 The World of Color show was the main reason we went to Disneyland on March 10. We got Fastpasses as part of the D23 2nd Anniversary event, so we did not have to worry about getting over to the park when it opened. It is definitely a good idea to get over to Disney's California Adventure first thing for fastpasses, as they were supposedly gone by 11:30am that day and it was not quite the peak season, yet. Mik often does not care for the shows (he still has never seen Fantasmic) other than the indoor theater ones (Aladdin, Great Moments with Lincoln, etc.). However, we have both been looking forward to this show since we have seen the area under remodel back in 2009. It opened last summer, but we visited in April last year. We got to the Fastpass area around 7:15pm (show started at 8:15pm) and it was already quite full. We were in the yellow area, but when we got there they directed us to go to the next area to get to the ramp. We got over there and the cast member taking the Fastpasses for that area (Red?) was ready to send us back to yellow, but another cast member knew that we were sent there for the ramp and escorted us down. He did not quite know where he was going, but he was very friendly and did make sure we got down to a good wheelchair seating area. The wheelchair sections are manned to make sure other people do not crowd it. There is a row of benches in the front for those that need them. 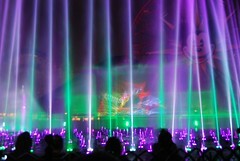 The area is not right in front, as there is a lower area right by the water, but the area is raised above the lower area, so there is no problem with people standing in front and getting in the way of enjoying the show. 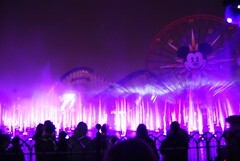 Mik and I both loved the World of Color show. 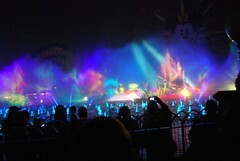 It was awesome how the video is projected on the water screens and the other lighting and flame effects. The end Tron scene is really awesome. Mik thought the wheelchair section was good, except that you get some of the spray depending on the wind. His pants ended up wet along with his top because he was sitting in his wheelchair compared to those standing only getting wet on top. He said next time he wants to bring a blanket for the show for that to get wet instead of him. At least that means he is willing to see it again, though, as it is pretty awesome.